A thought, sorry if it has been posted already. Updating the "Time" comic probably involved (or still involves) all kinds of repetitive manual tasks for Randall, so he created this chart to help him figure out what he should automate. If this guess is correct, it would be a hint that "Time" will last 5 years. Someguy945 wrote: If this guess is correct, it would be a hint that "Time" will last 5 years. mscha wrote: ¹: you know, like Brangelina. I'm actually rather fond of "Megball"... although it sounds like an obscure sport of some kind... still, got a ring to it. AluisioASG wrote: EDIT: BlitzGirl: please ignore all my two previously proposed titles. I'd feel honored if you accepted to be the “Archetypal Time Waiter”. Which two were those? The title wave has disoriented me a little. Plus lack of coma. Is Vanilla Ice a Time traveller, too? descor wrote: For all UK (& Eire, I guess) readers, all I need to say so you do not click that link is: Jedward. I am duly warned and will avoid the link. Thanks for the warning. Saved by international separation of YouTube: "The uploader has not made this video available in your country." VoronX wrote: Gee Willikers, all these hats has got me seriously jealous. Buffygirl, can I have one too? Should it be a Haida hat to match my sig? You're going to suffocate her this way. 'Cause, you know, it's...wait, what is it again?...oh right, big. I would so see that movie. Oh, good, I'm glad katakombe had a beverage to offer you. This leftover nut punch is getting pretty ripe. Blitzgirl, thanks for the bagels! jjjdavidson wrote: All I can think now is that, as this timeframe ends, all over North America bosses are going to be walking into offices to find their subordinates staring rapt at a blank white rectangle on the screen, maybe leaning in close and weaving back and forth. Reminds me of an ancient Dilbert where it has become impossible to tell the behavior of technophiles from that of babbling idiots. THE END IS NEAR! RE-PAINT, RE-PAINT! THE KING DUMB OF HEY VAN IS AT STAN! This was great. 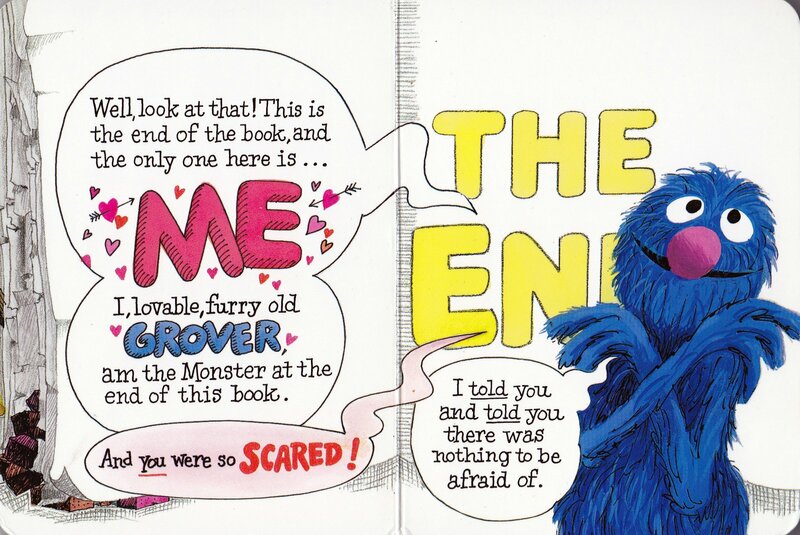 I LOVED that book when I was little. Still do, actually. 1Does not actually need a hat, as my current avatar is almost entirely unhattable. Does the person who maintains the xkcd.aubronwood.com site still check this thread? If so, I think (s)he should update the page to show the original posting time of each frame. Would be helpful for those of us who can't follow the comic closely in real time. If TheMinim is a male, I think you might be too late to keep the other thing off the bacon. StratPlayer wrote: Saved by international separation of YouTube: "The uploader has not made this video available in your country." I've noticed (from a few things I've uploaded that happened to have a bit of this in the background) that YouTube's copyright rules also protect people in Germany from Rickrolls. I have been lurking since the beginning of Time (Us lurkers are hiding around every corner). I was there for the single darkening pixel, for the mini-trebuchet, for the journey of Blitzgirl, and for the fading. I almost cried, you made it home! You completed your journey! I am so happy you survived. Thank you, thank you so much for doing what had to be done, thank you for risking being stuck in the past. It was truly a rewarding experience to watch you travel. And to everyone else: I think Time is almost come to an end, I expect it will be over entirely by the end of the week, if not in the next few days. So once again, thank you for participating, and giving me something to be a part of, even though I did not speak, I was still with you the whole way. Millah wrote: Does the person who maintains the xkcd.aubronwood.com site still check this thread? If so, I think (s)he should update the page to show the original posting time of each frame. Would be helpful for those of us who can't follow the comic closely in real time. Last edited by dgbrt on Mon Apr 29, 2013 7:52 pm UTC, edited 1 time in total. Swein wrote: They are going uphill. Some mountaineering ahead? After the Sea¹ Eon, the Mountain² Eon? For another thousand newpixes? Sounds great and highly plausible! Last edited by Pikrass on Mon Apr 29, 2013 8:38 pm UTC, edited 1 time in total. Angelastic wrote: If TheMinim is a male, I think you might be too late to keep the other thing off the bacon. Ahh, TheMinim is female. And likes to refer to herself in third person. She's a bit strange. ETA - But doesn't mind being thought of as Male. 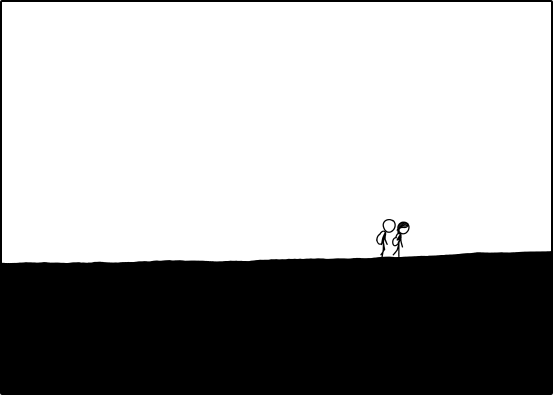 I was thinking about http://xkcd.com/1205/ and I would argue that it is not a coder's [or at least my] goal to save time for myself, but just to make it more enjoyable. Swein wrote: Jeez! Timewaiters are writing quicker than I can read! Anyway I want more party to celebrate the post whitening wait, the arrival of Blitzgirl and thats everything is great in general! Cakes and cockies are nice but I want Champagne! Ooh, I just got a bottle of that! *pops the cork* Yay! Party! Oh haaay! I thought the party had ended but silly me - this is one of the things we have been waiting for! As new people awaken from coma, they'll just keep the Blitzrandir party going. Champagne! Bacon! Now I have to get dressed up and let my soon-to-be-past-self wait for Kryton so he has a date. Kieryn wrote: I was thinking about http://xkcd.com/1205/ and I would argue that it is not a coder's [or at least my] goal to save time for myself, but just to make it more enjoyable. PS: if you see posts of mine in other threads, it's just an illusion. Stating otherwise is heresy, unless it is I the one stating it. Is it a different black now than it was before the fading? Been waiting ages to use this one. You know, every time you write phqmm I read it as phlegm and go, "Ewwww..."
Reminds me of the flying party that never ends from Hitchhiker's Guide. Last edited by descor on Mon Apr 29, 2013 8:09 pm UTC, edited 2 times in total. At this moment, unless they dump their bags someplace, it can't loop - Cuegan didn't have bags with them in the first frame! Hi buffygirl! It's an honor to meet She-Of-The-Many-Hats in the Present! woods wrote: I have been lurking since the beginning of Time (Us lurkers are hiding around every corner). I was there for the single darkening pixel, for the mini-trebuchet, for the journey of Blitzgirl, and for the fading. Thank you, woods! It is a pleasure to have shared a journey with you. Still five pages back in time playing catch up, but welcome blitzgirl to the present, hope I can get there soon. Very happy to see time hasn't ended yet. See you all soon, in black and white. SBN wrote: Is it a different black now than it was before the fading? No more semencancerbabycoffee, but normal black. Does not actually need a hat, as my current avatar is almost entirely unhattable. Actually, I think your current avatar looks like a wizard's hat (on the left) at a disco. So, where they are going? And what did happen to LaPetite? 1/1190 seconds? Oh, you mean 233.43 nanonewpix? At first those may appear to be the same, but look closely: the zeroes have been rearranged into a different order! Not only have they retuned (+1 for Megball), but so has this forums fav game : Wild Mass Guessing. I wonder what it means when I open a tab and the "most frequent" sites take me directly to: xkcd: Time 1190; explain-wiki's Time article; The Time-wiki and this forum????? Last edited by pelrigg on Mon Apr 29, 2013 8:22 pm UTC, edited 1 time in total. Had to go right after the absolute FFFFFFrame, kids came home, dinner, went to bed, and I thought to myself, maybe, just maybe, there were some white frames and then something changed a little. Maybe signs of fade-in? Will the hashes keep flowing? And there was much rejoice! But now, someone will have to stitch those images together, right? LaPetite is in one of the bags. She steps out of the bag and takes both bags with her, leaving Megan and Cueball alone to rebuild Time once again. aeglaeca wrote: Still five pages back in time playing catch up, but welcome blitzgirl to the present, hope I can get there soon. Very happy to see time hasn't ended yet. See you all soon, in black and white. That would require quite the case of amnesia... you'd have to make sure they lose the bags by something hitting their head. And their convenient rolling onto a beach. Good spot! How did none of the other pixel-monkeys1 notice that? Last edited by descor on Mon Apr 29, 2013 8:23 pm UTC, edited 1 time in total. LaPetite is lonely, while Cueball and Megan have their fun. Megan is one of my favorite girl's names. LaPetite wants to join in and say some really cool stuff, but her limitations and social anxiety means all she feels she can do is watch. Cueball and Megan don't notice her. She either goes completely crazy and kills them both, just gets on with her life, or Megan and Cueball invite her to join them. Or they all get killed in a meteor strike after riding dinosaurs through the time warp. Or maybe I just want to say something cool.